Figure 1. In heat pipes, the wick is typically adjacent to the envelope. 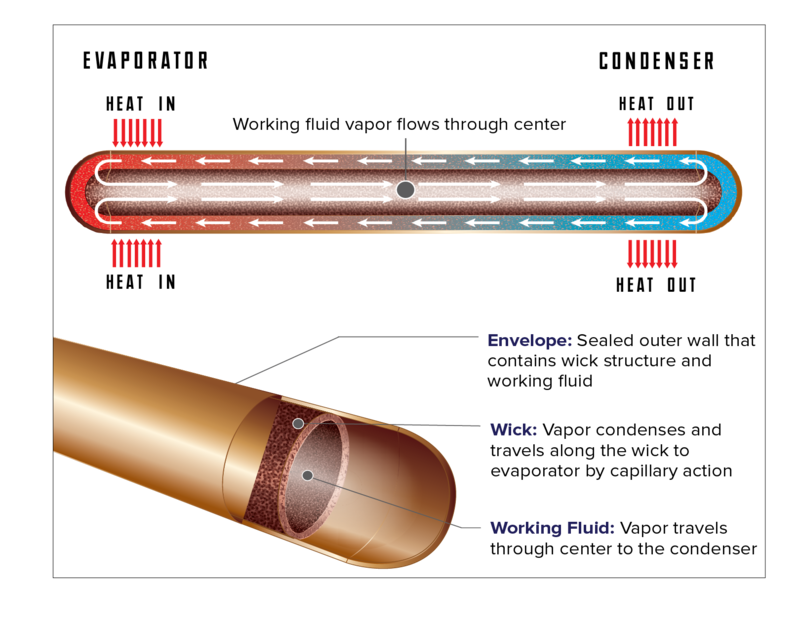 The liquid that condenses in the condenser travels through the wick along the length of the entire heat pipe. The liquid pressure drop is normally the largest pressure drop during heat pipe operation. 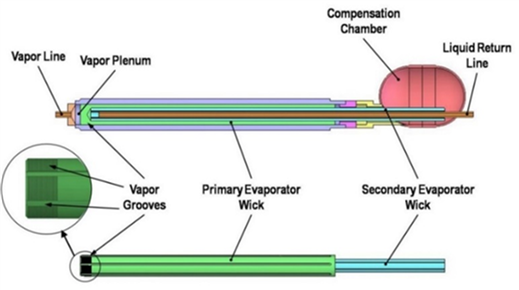 In heat pipes, the liquid must travel through the wick from condenser to evaporator, as shown in Figure 1. As discussed in the capillary limit, the pressure drop through the wick is normally the majority of the overall pressure drop in the heat pipe. The longer the heat pipe, the higher the pressure drop (or the lower the power that can be carried). This limits most copper/water heat pipes to a length of about 25 cm (10 in.). 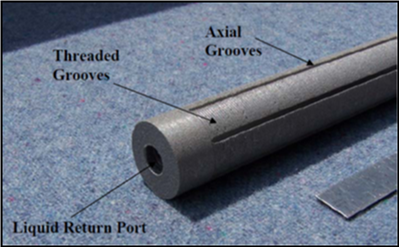 Grooved wicks can carry several hundred watts over several meters for heat pipes operating in microgravity. Loop Heat Pipes (LHPs) and capillary pumped loops were developed starting in the 1990s as alternate passive, capillary-pumped two-phase systems that can operate over longer distances, and at higher powers. They accomplish this by using an inverted wick in their evaporators, where the vapor spaces in the evaporator are located adjacent to the evaporator wall. A wick is not required for the liquid to flow in the condenser and the liquid return line, greatly reducing the liquid pressure drop. As shown in Figure 2, liquid travels into the center of the evaporator through a bayonet. The liquid travels radially in the wick, and vaporizes in the vapor grooves on the exterior of the wick, next to the evaporator envelope. The benefit of this design is that the liquid only travels roughly 1 cm through the wick. This allows the LHP evaporator wick to have a much smaller pore size (typically ~ 1 µm) compared with heat pipes wicks. In turn the LHP can carry up to 1 kW over distances of several meters, and at much higher adverse elevations than a heat pipe. Figure 2. Loop Evaporator and Compensation Chamber, showing the inverted wick. Liquid enters the center of the cylindrical wick through the liquid return line, and then travels radially to the outside of the wick. Figure 3. Photograph of an LHP evaporator’s primary wick structure, showing the machined radial and axial vapor grooves. Vapor is supplied to the wick through the liquid return port. It travels radially, and vaporizes in the axial grooves. Figure 3 shows the inverted wick on the exterior surface of the LHP evaporator wick. Liquid travels radially in the wick, and vaporizes is the threaded grooves. The vapor travels to the axial grooves, and then to the vapor line. Prior to inserting the LHP in the evaporator, it is machined to very tight tolerances, see Figure 4a. Figure 4b shows the wick after insertion, including the axial grooves in the inverted wick. Figure 4. (a) LHP wick adjacent to evaporator body before insertion. (b) LHP wick inserted in the evaporator body. Note the axial grooves, which deliver the vapor to the vapor line.